Officials in Anchorage are re-evaluating the city’s strategy for reducing homelessness. At a press conference at city hall Thursday, the mayor’s administration unveiled a new two-part plan they hope will improve coordination and accountability. 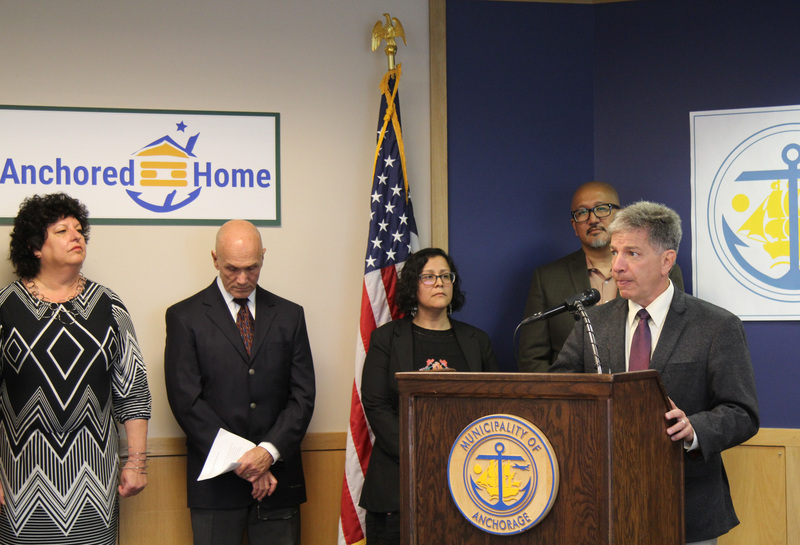 In a packed conference room, Mayor Ethan Berkowitz announced the formation of the Homelessness Community Leadership Council. Co-chaired by the mayor and one of the heads of Providence hospital, the council has 10 additional volunteer members drawn from prominent non-profits, private companies and real-estate groups. The idea is to facilitate conversations between people who aren’t typically coordinating when it comes to the issue of homelessness. And to use funding pools more efficiently. “Part of the problem is, when I talk about the $25 million-plus that’s being spent on homelessness in this community, it’s very diffuse, it’s not organized,” Berkowitz said. The second part of the measures is an update to a comprehensive strategy from 2015 for reducing homelessness. The modified plan, called “Anchored Home,” is still in draft form, and the administration has public events next month to gather input from community members. Jasmine Khan directs the Anchorage Coalition to End Homelessness and is overseeing the initiative, along with the city’s homelessness coordinator, Nancy Burke. According to Khan, the aim is not just to have strategies put on paper, but offer clear deliverables among stakeholders, establish accountability and collect good data on different sub-groups dealing with homelessness. “What Anchored Home is about is coalescing these plans into one plan, so we’re looking at the problem holistically versus looking at each population,” Khan said. The document will be finalized and implemented in October. The municipality is holding a public hearing on September 18th at the Loussac Library.